On Creation Day 6, after God made the land animals, He made man. Evolutionists insist that man came billions of years later. Not so, according to many investigators who follow evidence where it leads. Then God said, “Let Us make man in Our image, according to Our likeness; and let them rule over the fish of the sea and over the birds of the sky and over the cattle and over all the earth, and over every creeping thing that creeps on the earth.” God created man in His own image, in the image of God He created him; male and female He created them. God blessed them; and God said to them, “ Be fruitful and multiply, and fill the earth, and subdue it; and rule over the fish of the sea and over the birds of the sky and over every living thing that moves on the earth.” Then God said, “Behold, I have given you every plant yielding seed that is on the surface of all the earth, and every tree which has fruit yielding seed; it shall be food for you; and to every beast of the earth and to every bird of the sky and to every thing that moves on the earth which has life, I have given every green plant for food”; and it was so. God saw all that He had made, and behold, it was very good. And there was evening and there was morning, the sixth day. Human beings look like God. They are the closest things on God’s earth that looks like Him. So all attempts to make things on earth to look like God are plain foolishness. When the idol makers distort what man looks like (Chinese “gods” with tall brain pans; Canaanite “goddesses” with many breasts; etc. ), they act even more foolishly. Human beings are ruling stewards of the earth. Man is not lower than nature. He is a part of nature, and higher than the wild. God told human beings to multiply. So “population control” breaks Divine orders. The first food for animals and man, before the Fall, were fruits and vegetables. This would not hold forever; under the Noahide laws, God lets man eat flesh as well. But at least one dietary theorist cites Genesis 1:29 to say that the proper diet for man is a vegan diet, or at least a fructo-vegetarian one. Then this chapter says another, all-important thing: God has finished his creative work. The Hebrew phrase, that most translators render as “very good,” is mo’ed tov. This means more than “good.” It means absolutely excellent, with no room to improve it. Creation Day 6 closes Creation Week, and leads to God’s day of rest. 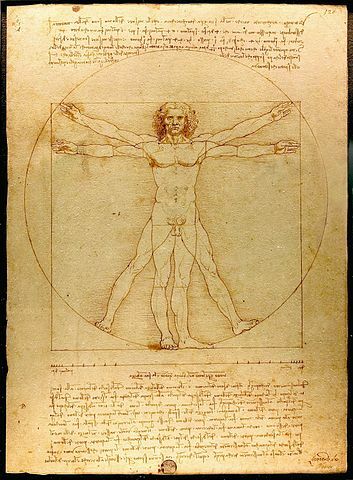 Vitruvian Man, the most famous of all anatomical drawings. Graphic: Leonardo da Vinci. Evolutionists, of course, do not recognize Creation Day 6 or any Creation Day. They insist that life shapes and re-shapes itself constantly. And it has done this for at least 3.8 billion years. The real evidence poses two problems. One is trying to tell exactly how man “evolved,” and from what. No one seriously says that man came from monkeys. Instead, anthropologists tell us that man came from chimpanzees. The reason: of all the apes, or simians (all names for “animals that look like man”), chimpanzees are closest to man, in how they look, and in their chromosomes and genes. But where are the “evolving” chimpanzee fossils? Where is the link between chimpanzee and man? The link is—you guessed it—missing. Walter T. Brown has assembled many other contradictions, misunderstandings, and outright frauds that make mockeries of anthropology. Piltdown Man is the obvious fraud. Peking Man (Homo erectus) turns out to be an ape that men ate. Java Man and Ramapithecus were also apes. Nebraska Man was lower than that: a pig! If the Global Flood killed every man and woman alive but eight, where are the bodies? The fact of the matter is: scientists have found them. And they don’t want to talk about it. On Creation Day 6, the last day of creation, God made his best work: man. God did not “try and err” in anything, and certainly not when making human beings. Anyone who takes an honest look at the evidence can see this.